multiple direct and proxy wars. His rhetoric about winding them down rings hollow. He wants to make the most of the next four years. No targeted country left behind reflects his agenda. He’s ravaging the world multiple countries at a time. He’s out-of-control. He governs like a serial killer. He plans more war on Iran, perhaps Lebanon, and full-scale intervention against Syria. He has other targets in mind. He’s insatiable. Africa dreaming explains what’s on his mind. On December 15, 2006, the United States Africa Command (AFRICOM) was authorized. On February 6, 2007, it was announced. On October 1, 2007, it was established, and on October 1, 2008, it became operational. It’s based in Stuttgart, Germany, not Africa. 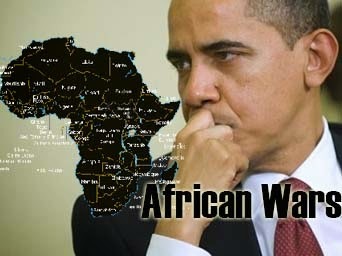 It’s responsible for warmaking and military relations throughout the continent. It’s comprised of 53 countries. Many potential targets are represented. Washington wants the entire continent colonized and controlled. It’s resource rich. It has large amounts of oil, gas, water, gold, silver, diamonds, iron, cobalt, uranium, copper, bauxite, manganese, other valued minerals, and rich agricultural land. His message was clear. Open the continent to Western investment and development. Privatize, privatize, privatize. Forget about providing healthcare, education, and other vital services. Give US and other Western corporate predators free reign. Play the game the way Washington demands or suffer the consequences. Ghana got the message. Why else would Obama show up. Libya didn’t. Gaddafi paid with his life. The country became another NATO trophy. Africa’s most developed country became a charnel house. Egypt’s on the boil. Morsi is Washington’s man in Cairo. Street protests strongly contest his dictatorial governance. As long as he maintains US support, he can rule any way he wishes. Washington’s war on Libya created out-of-control violence and instability. Tribes, rebel gangs, and green resistance fighters battle for dominance. Puppet leaders America installed have little or no authority. No end of conflict looms. Mali’s late March military coup appears fallout from Libya. It may be replicated elsewhere in North Africa and other areas. Niger’s endangered. There’s more involved than meets the eye, including controlling regional resources. Besides oil, Libya, Mali, and Niger have valuable uranium deposits. Washington seeks control. In October, EU Foreign Affairs and Security Policy head, Catherine Ashton, was involved in developing a Mali mission within 30 days. According to EU diplomats, it involves deploying 150 European military experts to train Malian and other African forces over a four to six month period. On October 12, the Security Council approved an international military mission to Mali. Ban Ki-moon was enlisted to help develop military intervention plans. Finalizing them was planned for end of November. France drafted the UN resolution. It was Washington’s lead attack dog on Libya. It may have the same role on Mali. In late March, monsoon season starts. Expect something early next year in advance. African troops will be involved. Germany agreed to participate. Britain likely also. Washington remains in charge. Whatever is coming will be another Obama war. Officially it’s because Islamists seized power in northern Mali. The area replicates France in size. Before his ouster, Gaddafi was a stabilizing force. Investments and mediation efforts prevented conflict between governing authorities and Tuareg rebels. Things change a year ago. Heavy armed rebels mobilized. In March 2012, Long-time Malian President Amadou Toumani Toure was deposed. Local Islamists controlled northern areas with Tauregs. Islamists with Al Qaeda ties drove them out. According to the Wall Street Journal, Obama wants congressional approval to intervene. With or without it, he’ll do what he wants. US special forces and drone attacks may be planned. Operations may be similar to Washington’s proxy wars on Somalia and Yemen.